Lyn Risling’s solo exhibition, "Reconnecting: A Cultural Journey", opens on Thursday, Feb. 14, with a reception, 4:30-6:30 p.m., and artist’s talk at 5 p.m., both in the Goudi’ni Gallery. The show will run through March 10. 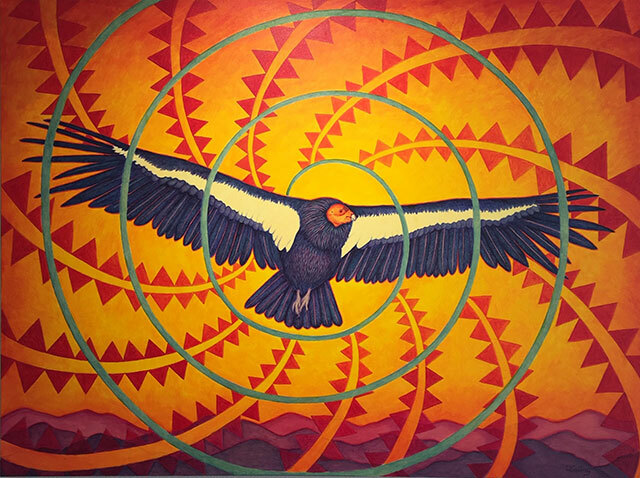 Aachviivkaam tu’ípak (Condor Returns), 2018, acrylic on canvasThis exhibition will feature artwork by Lyn Risling, celebrating the publication of her latest illustrated book, Coyote at the Big Time: A California Indian 123 (2018), and also showcasing her earlier book A is For Acorn: A California Indian ABC (2015). The show combines a large selection of Risling’s captivating paintings, including original artwork from her published books, with copies of her published books, as well as ceremonial regalia and intricately patterned Native American baskets. Risling is an important local artist whose work draws strongly from her ancestral connections with the Karuk, Yurok, and Hupa peoples of the Klamath and Trinity rivers in Northern California. Her colorful paintings are reflections of her cultural heritage and the landscapes of her ancestral homelands. 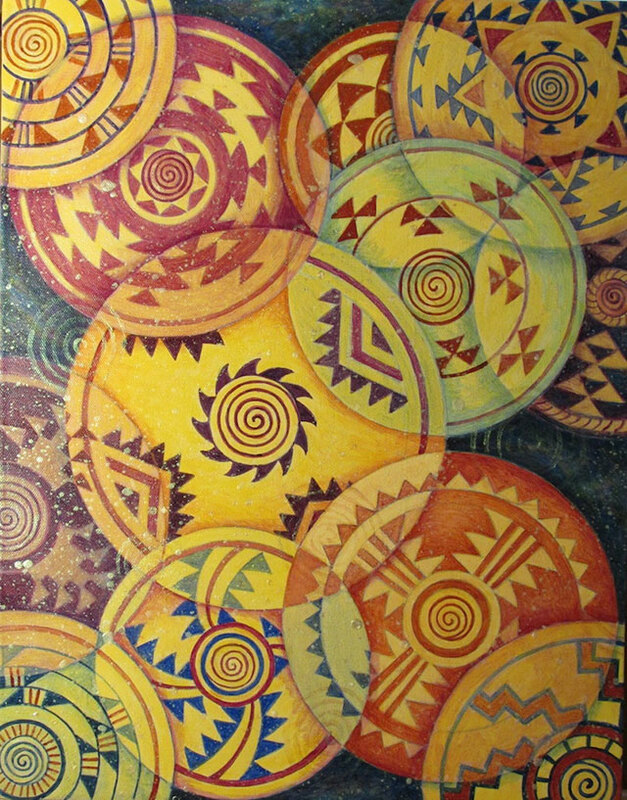 Her work is a continuum, connecting past, present, and future with Earth and Spirit, synthesizing traditional designs with contemporary experiences, issues, and perspectives. Her vibrant paintings and colorfully illustrated books and artworks welcome young and old, children, parents, families from all cultures into the abundant world of Native California. This exhibition is curated by Museum & Gallery Practice Class under the direction of Ian Carey (Instructor), Britt Sheldon (Gallery Director), and Gabby Reisz (Gallery Assistant). Exhibit support by Instructionally Related Activities, HSU Art Department, the HSU Office of Diversity, Equity, and Inclusion, and the Clarke Museum. The Goudi’ni Gallery is located on 17th street and Union, on the ground floor of the HSU Behavioral and Social Sciences Building. Gallery hours are: Monday closed, Tuesday-Wednesday 12-5 p.m., Thursday 12-7 p.m., Friday 12-7 p.m. (12-8 Arts! Arcata), Saturday-Sunday 12-5 p.m. For more information about the gallery, please call the gallery office at 707.826.3629 or email at rbg@humboldt.edu or bs228@humboldt.edu. For parking information, please visit humboldt.edu/parking.